JOHANNES BRAHMS (1833-1897): Symphony No. 1, Op. 68, in C Minor (1855-76). The extremely long gestation period of Brahms’s First Symphony has attained almost legendary status. Brahms certainly approached the composition of his first symphony with extreme respect. Already proclaimed by Schumann in the 1850s to be the heir apparent to Beethoven, Brahms knew that his first symphonic effort would be subject to intense scrutiny and high expectations. However, when Brahms published his First Symphony after more than twenty years as an active composer, it was instantly hailed as a supreme masterpiece. Its key of C minor with an ending in C major drew immediate comparison to Beethoven’s legendary Fifth Symphony. Moreover, the complexity of Brahms’s first movement, with its dense web of motives and lack of “singable” melodies, is balanced, much like in Beethoven, by exciting climaxes and passionate energy. 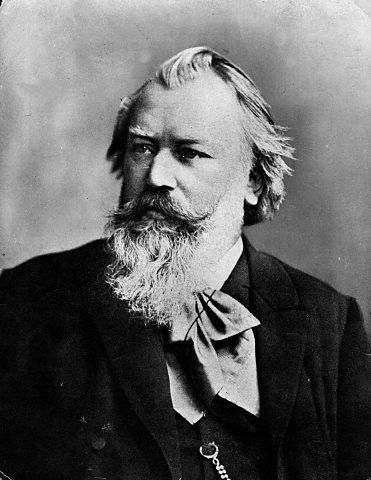 Brahms’s middle movements also have notable features, such as the nebulous phrase structure of the slow movement, the metrical ambiguities of its middle section, and the violin solo at the end, a rare indulgence for mature Brahms. While the third movement structurally resembles a scherzo and trio, it is certainly no scherzo. Nevertheless, such a moderately-paced “scherzo substitute” would ultimately appear in Brahms’s Second Symphony and Third Symphony as well. One innovative aspect of Brahms’s overall design is the symmetrical progression by major thirds between the movements: C, E, A♭, C - an unusual layout. Brahms also followed Beethoven in shifting the weight towards the finale, in this case, a huge movement with a large double introduction. When the main part finally arrives, there is Brahms’s most inspired theme, the “big tune” that was soon compared to the “joy” theme of Beethoven’s Ninth. But Brahms’s First Symphony is more than a legend and one “big tune.” It is, with all due respect to Mahler’s “Titan,” the greatest First Symphony ever written, from the pounding timpani of the first movement’s introduction to the blazing C major chords at the end.